About the piece: Villa d’Este is an Italian Renaissance palace in Tivoli, a town approximately 30 km east of Rome, up in the mountains. It was built 1550–1572 by cardinal Ippolito d’Este, and it is known for the stunning garden with its profusion of fountains, constructed between 1566 and 1577, with 220 basins and 762 spouts and water jets that work entirely by the force of gravity, without any pumps. …..It has been admired ever since the 16th century and it soon became an essential stop for all those who made a grand tour, i.e. the educational journey that young men of the European nobility undertook during the 17th and 18th centuries. The beauty of the villa, its gardens and its fountains has always attracted artists, poets, and musicians. One of them was the composer and pianist Franz Liszt, who spent quite a lot of time there between 1865 and 1885, and he also wrote two piano pieces inspired by the garden and its fountains. …..Among these fountains we find Fontana dell’organo (The Fountain of the Organ), which is one the most famous features of the garden. It has an automatic organ, powered by the running water, the first of its kind, constructed in 1571. Its delicate mechanism deteriorated over the years and it required continuos and expensive maintenance, eventually leading to it becoming abandoned by the end of the 18th century. It was reconstructed in 2003, however, and can now be enjoyed by visitors from all over the world. It plays five times every day, each time a little suite of the four Renaissance dances that this composition is based on: Saltarello (1551) by Tilman Susato, La Romanesca (1575) by Antonio Valente, and, finally, La Shy Myze and La Doune Cella — two pieces from The Mulliner Book (c.1560). …..There are six specific fountains that have inspired me to this concert piece for organ and orchestra. The first part of the piece describes a walk along Cento fontane (The Hundred Fountains), a long row of close to 300 small spouts and fountains. Then the above-mentioned Fontana dell’organo. The music is very agile and moves around, mostly above middle C, with small cascades of notes gradually growing into one of the dance tunes of Fontana dell’organo. …..This section is followed by the arrival at Fontana dell’ovato (The Oval Fountain), and the music takes a plunge into the deepest bass register, depicting this wide water theatre, spraying large amounts of water in many forms. We also pass Fontana della civetta (The Fountain of the Owl), where the sound of mechanical birds can be heard. …..In the last part of the piece, I have tried to capture the grandeur of Fontana di Nettuno (The Fountain of Neptune), which is the largest and most impressive of all the fountains in the garden. On the way to this majestic experience, we pass Fontana dei draghi (The Fountain of the Dragons), with its massive vertical column of water shooting straight up in the air, surrounded by smaller jets of water. First performance: 9 May 2019, The Concert Hall of Norrlandsoperan, Umeå, Sweden. Trio ZPR and the orchestra of Norrlandsoperan, conducted by Anja Bielmaier. About the piece: This concerto for string trio and orchestra is inspired by the artistry of the Italian painter Roberto Ferri, born in 1978 in Taranto, Puglia, and now living in Rome. When I first saw his paintings, around 2010, I was immediately stunned by the incredible craftsmanship and brilliance that his paintings radiate. His motives are sometimes mythological, sometimes quite modern, but always with a personal twist. Nothing is plain or simple. Beauty is accompanied by pain and mystic rituals, and the scenes are often odd and surprising. His technique is inspired by Caravaggio and symbolism, which leads to a very exciting mix between old and new that directly strikes a chord in me. He is particularly skilful in depicting the human body, but quite often he abandons realism and adds surreal and thought- provoking elements. …..The five paintings that have inspired me to this concerto are all from his collection Oltre i sensi (Beyond the Senses), which was exhibited in London and Rome in 2009, and also presented in a beautiful printed catalogue: Taras (2007), San Sebastiano (2008), Angelo caduto (2008), Oraculum (2007), and Dioniso (2008). …..However, I do not want to limit the listener’s experience by linking the music too much to any specific work of art. My intention is not to try to illustrate or describe the paintings in music, even if they certainly have inspired me in my creative work. My approach is that the paintings serve as scaffolding during the composition process. When the work is finished, the scaffolding should be removed and the composition should hopefully be able to stand on its own, without support. - Percussion instruments (2 players): crotales, bass drum, cassa chiara [side drum] without snares, tambourine. Publisher: Swedish Music Information Centre, Stockholm. First performance: 11 May 2017, De Geer Hall, Norrköping. Paul Waltman (violin) and Norrköping Symphony Orchestra, conducted by B. Tommy Andersson. About the piece: This concerto for violin and orchestra is composed in honour of the inspired artistry of Michelangelo Buonarroti (1475–1564). For many years, I have regularly travelled in Italy and have frequently had the privilege to enjoy his masterpieces in situ. His art is so alive and vibrant, even after all those years, and it has made a strong impact on me. Since I am quite impressionable to extramusical influences, I have nourished the thought of paying a tribute to this Italian renaissance master through my music. When I was commissioned to compose this piece, I immediately saw an opportunity to fulfil my desire. …..The most expected way to go about this mission would probably be to compose music inspired by specific works of art, but I have chosen a rather different path. Everyone knows that Michelangelo was a sculptor and painter, but it is not as widely known that he also wrote more than 300 poems. Many of them are in the formal rhyme scheme of a sonnet and about 30 of them are inspired by his friendship to the young nobleman Tommaso Cavalieri (1509–87), who became a lifelong and close friend. Among these specific sonnets, I picked out five that I set to music in a song cycle titled Sonetti di Michelangelo, for baritone and piano, finished 24 January 2016 (Sonnets No. 77, 60, 80, 89, 83). …..All of the melodies that I created for these songs are used in the violin concerto. Thereby I managed to create the link to Michelangelo I was seeking, inspired by his own words and emotions. But the music is also very much inspired by my own experience of Michelangelo’s visual art. During the composition process, I visited the Sistine Chapel in Rome several times, where I have always been particularly fascinated and awed by the paintings covering the ceiling, and I also revisited a number of other paintings and sculptures. However, I do not want to limit the listener’s experience by linking the music to any specific works of art. This violin concerto is rather an attempt to celebrate the universal beauty of Michelangelo’s art. - This piece can be played on any three-manual organ, as long as the instrument has the required sound qualities and is loud enough. It should even be possible to play on a two-manual instrument, if a good combination system is available. The registrations indicated by the composer in the organ part should be followed as closely as possible. Preferably, the organ should have a stoplist that includes at least one 16ft flue stop in the Hauptwerk (such as a Borduna, or a Principal), as well as Trumpets 16+8ft. A set of pedal reeds 16+8+4ft is required. - The size of the string orchestra should be adjusted to the organ in question. The sound of the strings should be experienced as rich and powerful in the room, regardless of the size of the orchestra. With a large symphonic organ in a concert hall or in a cathedral, a large string section is needed (approx. 14 First Violins, 12 Second Violins, 10 Violas, 8 Violoncellos, and 6 Doublebasses). But in a smaller room, with a not as loud organ, a small string orchestra could be enough (approx. 6 First Violins, 6 Second Violins, 4 Violas, 4 Violoncellos, and 2 Doublebasses). About the piece: This organ concerto is inspired by paintings of Albertus Pictor (Albrekt the Painter, c. 1440–1507), the most famous painter in late medieval Sweden, known for his wallpaintings in 37 churches in central Sweden. His murals are made in a secco technique, and the style is different from other contemporary painters by an unusually vibrant and moving expression. …..The music is inspired by eight specific images. The first motif returns at the end to complete the piece, and to remind us of the ever-spinning wheel of life. Here are the nine sections of the organ concerto. They all follow one another without interruption. The Wheel of Fortune, or The Wheel of Life (Livshjulet), was a widely used allegory in medieval literature and art. The music is inspired by the painting in Härkeberga Church. Death spins the wheel. On the way up on the wheel, on the left-hand side, you can see a young man. On the top you can see a man at the peak of life, and on the way down, on the right-hand side, you can see an ageing man on his way to the grave. 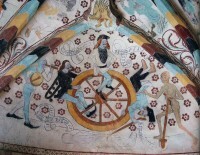 At the foot of the wheel is a dead body in a shroud. The scene is accompanied by a jester, who plays the flute and the drum. 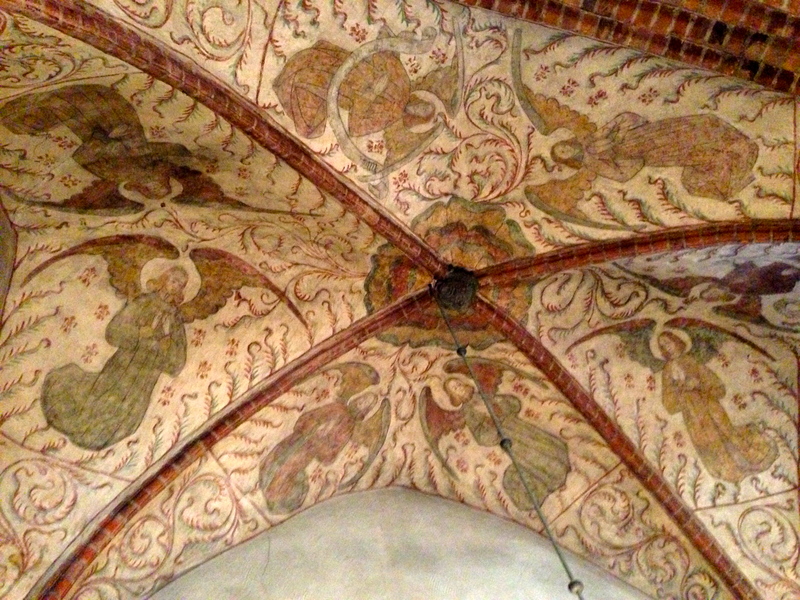 Albertus Pictor’s interpretation of this classic motif in Floda church. Both Mary and the child have haloes, nowadays dark, but originally they were undoubtably brightly red. The red paint pigment he used was made of red lead, which through time has darkened to a brownish, almost black colour. The scene is very peaceful and Mary looks like a ordinary mother, who plays tenderly with her little boy. Golden rays of glory radiates behind them. 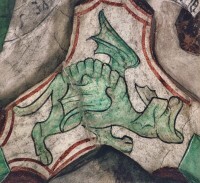 This painting is to be found in Härkeberga Church. Here we can see two simultaneous events in the same picture, a typical medieval feature. First, to the right, the fully dressed prophet Jonah being thrown into the sea and engulfed by something resembling a crocodile cross-bred with a giant snake. Then, to the left, a naked and pale Jonah being spitted up by the sea creature three days later. 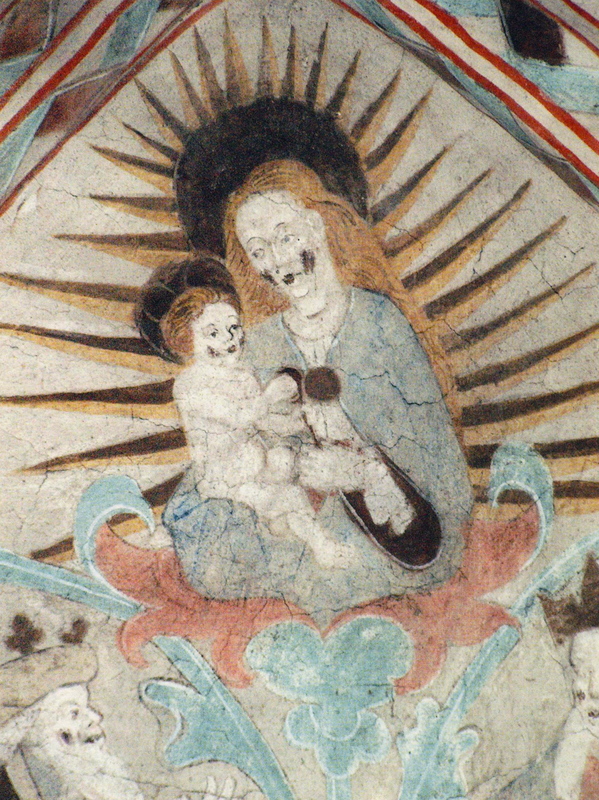 This lugubrious picture is painted in Täby Church, in a corner of the staircase leading up to the organ loft. 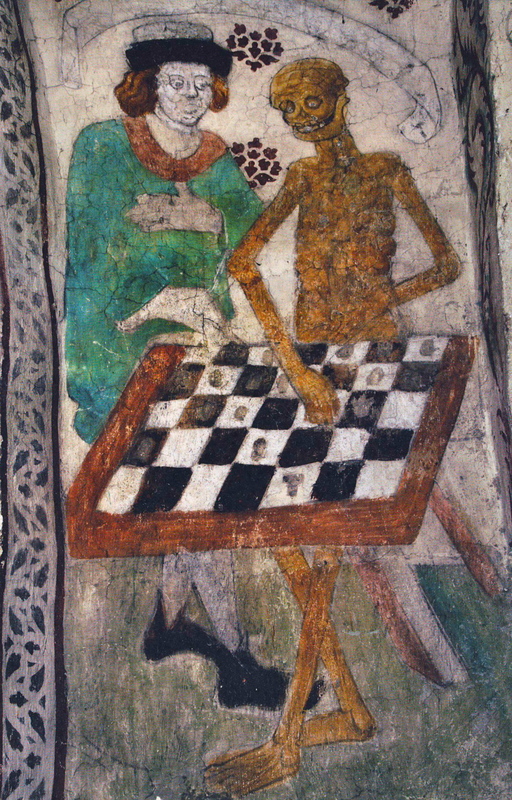 The motif inspired Ingmar Bergman to a famous scene in the 1957 film The Seventh Seal, where the knight Antonius Block plays chess with Death personified. In fact, the character Albertus Pictor actually appears in this film, in a dialogue with Jöns, Antonius Block’s henchman, while painting a church mural. 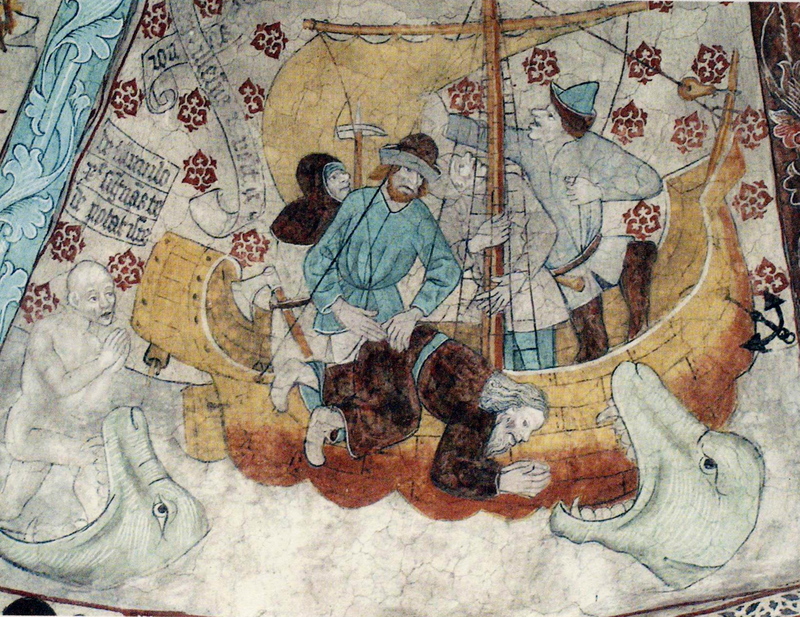 …..A text in Medieval Swedish was earlier to be found on the painting: “Jak spelar tik mat”. It is now obliterated, but we know of it from earlier writings on Albertus Pictor. In modern language it would be: “Jag spelar dig matt! / I put you into checkmate!” (says The Grim Reaper). Albertus Pictor’s paintings are full of grotesque animals, demons, and strange creatures. A visibly enraged green baby dragon, painted in Härnevi Church, flaps its wings and roars. The paintings in the ceiling of The Holy Trinity Church (Helga Trefaldighets kyrka) in Uppsala are rather unusual for Albertus Pictor. Here are no biblical tales, no strange or burlesque figures. Instead we see more than 60 angels, apparently guarding the church and praying for its visitors, an overwhelming and uplifting sight. Nowhere else are so many angels to be found. 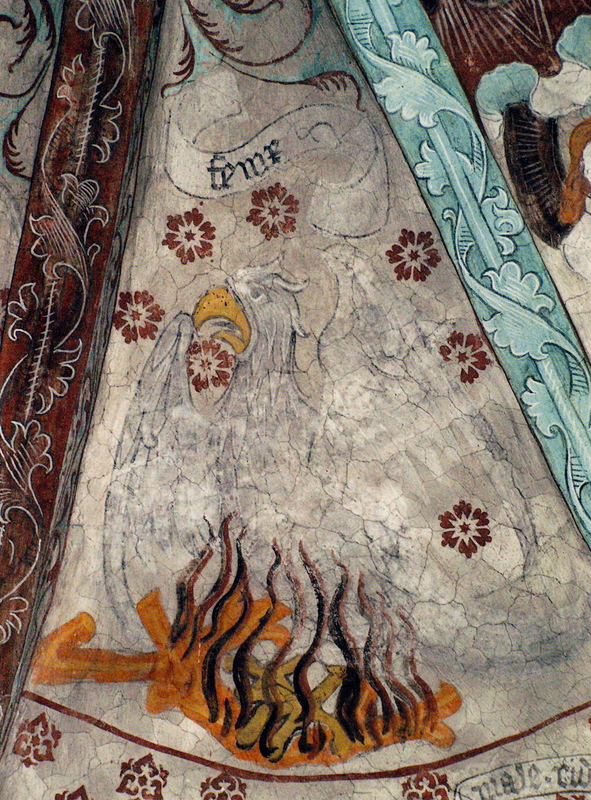 In medieval religious iconography, Phoenix is a symbol for the death and resurrection of Christ, but also for chastity, hope, and the church itself. 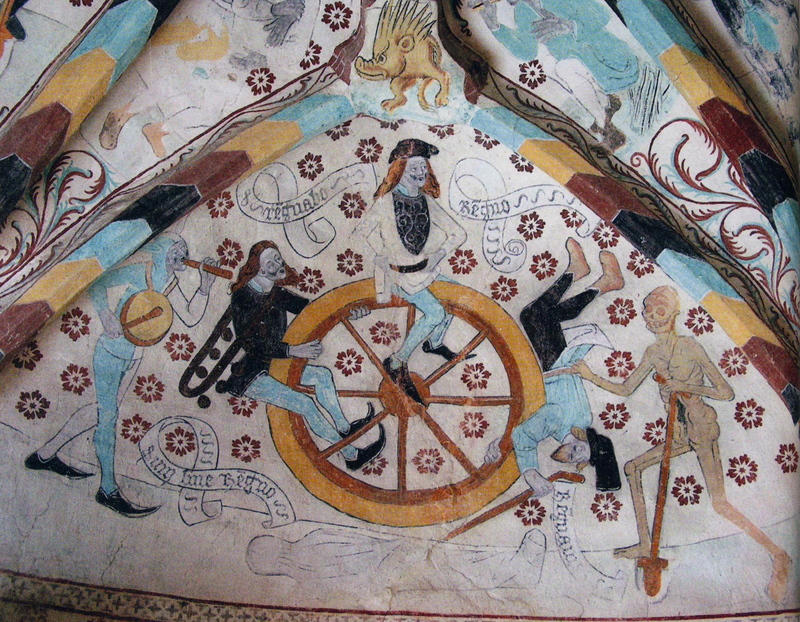 This painting, in Härkeberga Church, is Albertus Pictor’s only rendition of this motif. We can see a white bird, something between a raptor and a parrot, sitting in orange flames. 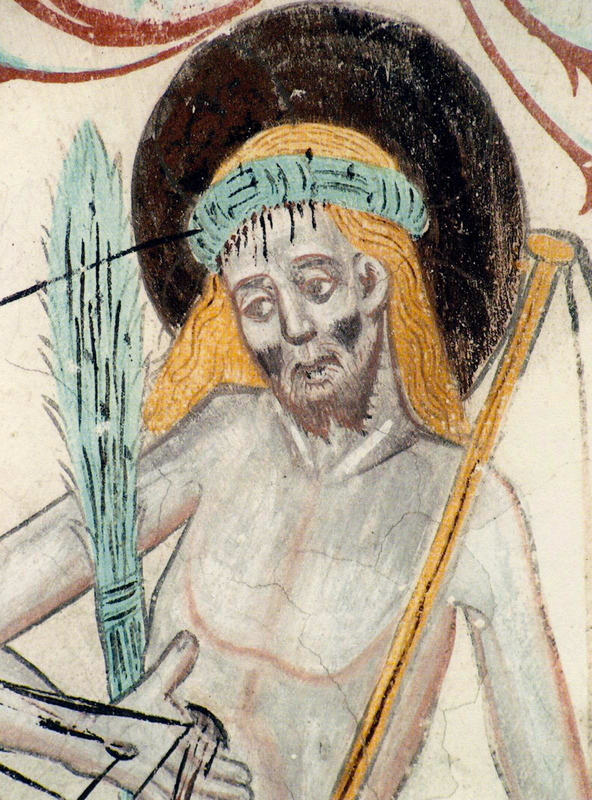 In the later Middle Ages, The Man of Sorrows (Smärtomannen) was a popular devotional image. During the renaissance, it was gradually replaced by the pietà motif. In Härnevi Church we can see the suffering Christ with his crown of thorns and bleeding wounds. A halo surrounds his head, nowadays black but originally brightly red, just as in the case of Virgin Mary and Infant Jesus. With his golden hair he looks like a man from Northern Europe. The Gregorian chant Jesu dulcis memoria is woven into the music. About the piece: Reflections is an hommage to two significant British composers from different periods, John Dowland (1563–1626) and Benjamin Britten (1913–76). The music consists of a set of variations on a song of Dowland, My Thoughts are Wing’d with Hopes, (No. 3 from The First Booke of Songs and Ayres, published in London 1597). xxxAs a young viola-player, I played Benjamin Britten’s beautiful piece Lacrymae — Reflections on a Song of Dowland, opus 48, for viola and piano (1950). The way Britten relates to Dowland’s music — full of respect and love — made a deep impression on me. In my piece Reflections, I borrow both the title and the approach from the 20th-century-master, Britten, although my musical language is different. xxxThe tonal material is limited to a mode, derived from the melody notes of the song (G, A-flat, B-flat, B, C, D, E-flat and F), with an additional F-sharp. Rhythmically, it is a play with various proportions of time divided into three (3/2, 3/4, 9/8, 9/16, etc) and ambiguous three-piece rhythms (hemiolas, etc) which are also typical of the renaissance music. After a lyrical opening in the spirit of the song, the music gradually intensifies up to a short, impetuous cadenza. The piece ends in the same poetical mode as the beginning, this time with direct quotations from the song. - When performed with large string section, the two horn parts should always be doubled (4 horns). - Percussion instruments in the solo part (one player): log drum (slit drum) with two deep notes, 2 wood drums (wood tom-toms), guiro, 4 wood-blocks, 2 piccolo wood-blocks (very small), bamboo chimes (wood chimes), large bass drum, pedal bass drum, 6 drums (bongos, congas, tom-toms, boo-bams or any other drums with good sound), 2 tam-tams with different timbre and pitch (low and medium), 2 deep Thai-gongs in A-flat and B-flat, large sizzle cymbal (suspended), medium cymbal (suspended), small splash cymbal (suspended), 2 Peking opera gongs, 4 Almglocken, 4 metals (choose objects of powerful sound, for exemple pipes), crotales (2 octaves), 2 suspended tambourines, rain maker, maracas (small). Recording: Caprice CAP 21466 (released 1996). 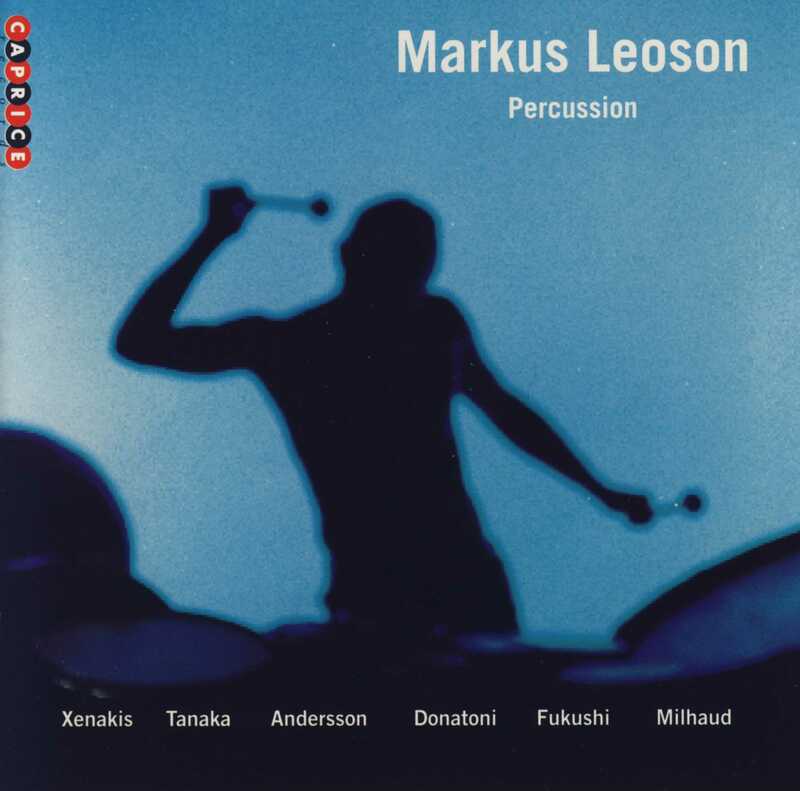 Markus Leoson (perc. 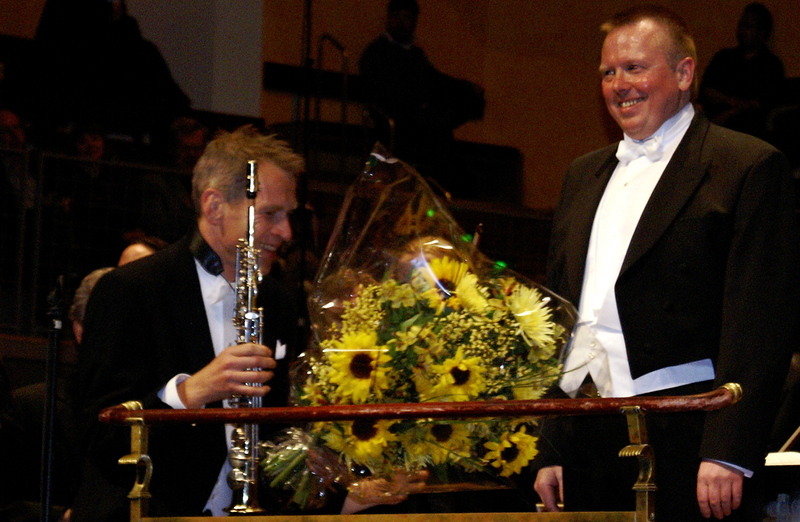 ), Sundsvall Chamber Orchestra, B. Tommy Andersson (cond.). About the piece: The Greek god Apollo is a subject of many myths, some of them describing his innumerable amatory adventures. As the god of Light, Medicine, Poetry and Music, he is frequently associated with sternness and self-control, in contrast to Dionysus, the god of Wine and Ecstasy. But there is a twin relationship between these gods. Both of them search for fire on the borderline of the permissible. This is the starting point of the piece — passion one doesn’t speak about, Apollo’s relationship to Cyparissos, Hyacinthos and Admetos. xxxThe concerto is made up of six distinct parts with bridge passages in between. The musical content is all the time related, but with perpetual metamorphoses. The tonal material is limited to two modes in the form of a nine- and an eight-tone scale. Apollo is symbolised by violent cascades of dotted rhythms on metal instruments. These rhythms, in various guises, permeate the whole piece. The mood alternates between explosive force, romanticism, playfulness and self-revealing dismay. Apollo was written expressly for and dedicated to Markus Leoson, inspired by his fantastic interpretative capacity and virtuosity. - Percussion instruments (one player): bass drum, clashed cymbals, tambourine, 2 tom-toms, triangle, large tam-tam. © 2019 B Tommy Andersson. All rights reserved.